Coahuila (Agenzia Fides) - The Bishop of Saltillo, Coahuila (Mexico), His Exc. Mgr. José Raúl Vera López, O.P. announced the discovery of Fr. Joaquin Hernandez Sifuentes’ body, who was missing since 3 January (see Fides 09/01/2017). 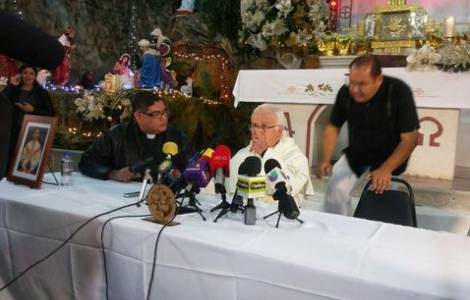 Yesterday, the Mexican authorities confirmed that one of the three bodies found in the state of Coahuila belongs to the priest. During a meeting with journalists, Mgr. Vera thanked the authorities for the work done and reported that there are no details of what happened: time, place and the reasons why the priest was murdered. According to information sent to Fides, two people are currently held as the alleged perpetrators of the crime, but they are still under investigation. Mgr. Vera said that since he has been the Bishop of Saltillo, this is the first time he has experienced a situation like this, and called on citizens to realize that even members of the clergy can become victims of any crime, not only simple citizens: "We live in a wrecked environment, in a shattered society, and priests do not live under a bell jar".